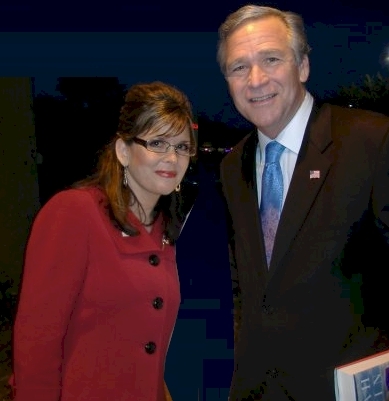 The Midnight Review: Did Sarah Palin Follow Mitt Romney's Book Manipulation Model? Did Sarah Palin Follow Mitt Romney's Book Manipulation Model? Friday's revelation that former Massachusetts Governor Mitt Romney managed to produce a best-selling book largely through the generosity and help of conservative institutions may have raised eyebrows in the political world. But in the publishing business it was greeted with shrugs and yawns. The manipulation of the book-ranking process has been a longstanding industry feature, perfected most commonly by Republican-leaning authors. A book industry source who spoke about the process on condition of anonymity, raised the curtain a bit on how Romney likely maneuvered his book, "No Apology: The Case for American Greatness," to the top of the New York Times bestseller list in March 2010. "What he did specifically is to get people to go to bookstores to buy big numbers of copies and to do it without letting on that it was a business-to-business transaction," said the source. "You never identify that you are part of the book tour. Some book sellers will be hip to it and if they smell a business-to-business transaction, the book sellers will not count those copies sold to the best-seller list." Makes you wonder about those other conservative authors - Sarah Palin, Glenn Beck, and Mark Levin all topped the best sellers list last year, and as we all know, Newsmax has pushed her books in the past - they are currently offering Sarah Palin's book for free if you enter into a trial subscription with their magazine. "The other hidden secret that everyone basically knows is that there are specific stores that are New York Times reporting stores. Most publishers know who they are. There are some independents and some chains. And basically their sales numbers are the ones passed to the Times." One feature of the book-ranking business that is not that commonly known, the source relayed, is that standings essentially reset on a weekly basis. Romney could be on top of the rankings for the week of March 21st (as he was on the New York Times hardcover non-fiction list), but to stay there, he had to keep selling books week after week. The paper didn't look at aggregate totals. I had trouble finding records for the New York Times's list, but I found a similar list on USA Today, showing that Palin's book entered the list in November last year, peaked at number one, and then dropped off the list some time in February. According to a blog post by Vicki McClure Davidson on the Frugal Cafe, Palin's book was number one back in January - hitting six weeks. A February post from another blog on the New York Times showed that Going Rogue dropped from number one to number five. I only bring up Palin's book tour and possible manipulation of the numbers because I have seen many conservative websites tout these numbers as proof America is behind their philosophies. I have also seen these websites compare Palin's book sales to that of Nancy Pelosi's. But the success of Romney's book indicates that the institutional framework still very much favors Republican authors. "With Democrats and with liberals, purchasing tends to be mobilizing individually as opposed to institutionally," said the industry source. How many speaking engagements did Palin have after her tour concluded? During? 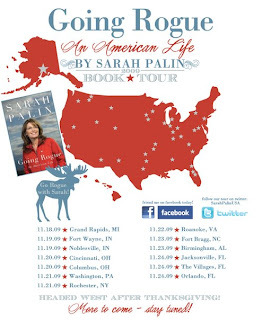 As a side note, when Palin came to Orlando for her book tour, from my understanding she did not really take pictures with the individuals (except for a handshake where she was sitting by professional photographer Sheelah Craighead), but she did offer the crowd Palin and Bush impersonators to take pictures with. Guess Palin didn't want to get up from her table of prepurchased books to stand with fans. This is a nifty bit of research, Kevin. Thank you! We can certainly be sure that if there are to ways to do something, one honest and one not, today's Republican leadership will always be found on the latter path.